The Taj Mahal is situated in Agra on the banks of the river Yamuna. It is in the state of Uttar Pradesh in the northern part of India, very close to New Delhi. The Taj Mahal is the epitome of beauty and an architectural feat. It stands smugly in all its glory even after many centuries since its construction. 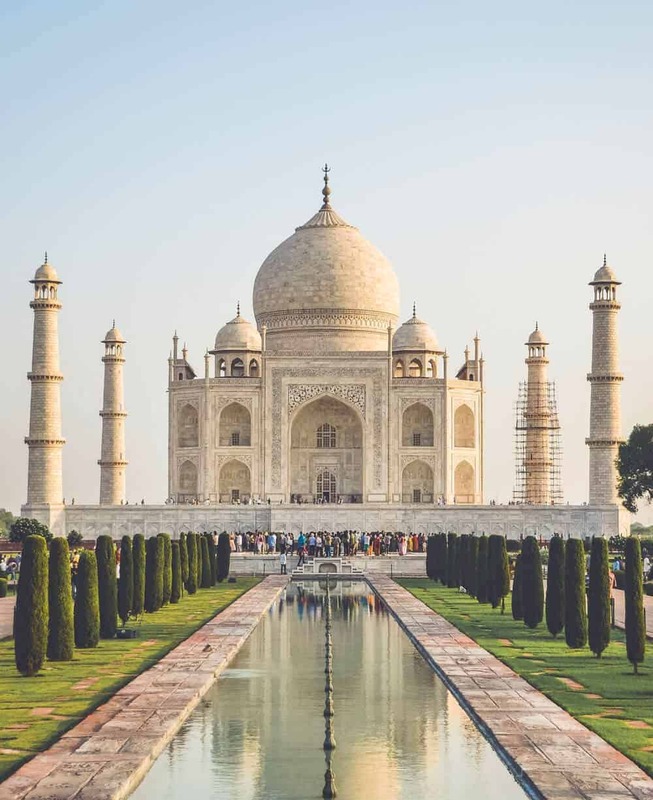 Shah Jahan commissioned the construction of the Taj Mahal as a symbolic expression of love to his dear wife Mumtaz Mahal upon her death in the year 1631. Taj Mahal not only evokes a sense of amazement at the extent an Emperor could go to build a monument of this sheer size for his love but also marvel at the precision and symmetry achieved in building this. Such is the beauty of this monument that it is considered one of the Seven Wonders of the World and rightly a UNESCO World Heritage Site. The below guide will give you all the details that you need before packing your bags to visit this enchanting place. All the information provided in the guide is valid as of June 2018. Taj Mahal is approximately 222 km away from New Delhi, so you will need around 3 – 4 hours by road or by train. Though the Taj Mahal makes for a good one-day trip, it is good to stay overnight as viewing the Taj during sunrise is an experience in itself. The Taj Mahal is open on all days except Fridays so plan your travel dates accordingly. The best time to visit Agra is during the winter between October to March. Though the air is bitter cold in the night, the warmth of the sun during the day makes for a perfect visit in these months. You can visit the Taj Mahal during the summer too from April to June. Beware that the temperatures during the day are very high and if you are sensitive to heat, you can visit the Taj during sunrise or sunset when the temperature is bearable. The best time of the day to visit the Taj Mahal is at sunrise when the gates open at 6 am every day. This is the perfect time for two reasons: lesser crowds and the elegant golden shine of the Taj against the first rays of the sun. There is no time limit on your ticket and you can stay as long as you want. The afternoon heat can be unbearable, so try to avoid going at this time. As a tip, you can enter at 6 am and leave at around 10 or 11 am. Or enter the complex at 3 pm and witness the sunset and head back. You must note that there is absolutely no access to food, so be prepared in advance. If you are flexible with dates, plan your visit around the full moon night when the Taj is open to visitors in the night between 8.30 pm to 12.30 am. Night viewing of Taj Mahal is available on five days in a month i.e. on full moon night and two nights before and two after the full moon. Each visitor is given just 30 minutes to behold the glory of the Taj as it glistens under the moonlight. However, the Taj is closed on all Fridays during the month of Ramzan. – For a quick glance as to when is the upcoming full moon days this year and the coming years, have a look at this list here. Tickets to enter the Taj Mahal are sold at two entry points – the Western and Eastern Gates. There are different ticket price slabs based on the nationality of the traveler. It is recommended to buy the tickets online here before reaching the venue to avoid waiting in queues. The length of the queue for the security check early mornings at 6 am are shorter and the process is swifter. As the day proceeds, the length of the queue gets longer. Be patient and keep your tickets handy to show it to the police to gain entry. Do not forget to carry necessary government approved ID cards with you when you visit the Taj Mahal. If you are a foreigner, do carry your passport with you at all times. There are a lot of places to exchange currency in Agra since it is a top tourist destination in India. You can find a lot of them on the popular Fatehabad Road in Agra. You can exchange currency at reliable places listed here. Agra is well connected by air, rail, and road. Taking a flight to Agra is the easiest from New Delhi as this is the only city that has direct flights to Agra. Rest of the cities in India including the metros like Mumbai, Kolkata, Chennai, Hyderabad, and Bangalore do not have direct flights to Agra. There are state-run and private-run buses plying between New Delhi and Agra on a daily basis. This is comfortable and cheaper to ride as the fare costs a maximum of 1000 INR to and fro. You can book your bus ticket on the popular Red Bus website. There is the 12050 Gatimaan Express (non-stop), 12002 New Delhi Bhopal Shatabdi Express and the 12280 Taj Express Superfast departing from New Delhi’s Hazrat Nizamuddin Railway Station every day between 6.00 am to 8.30 am. The journey is just two hours long with catering services on board. The main railway station in Agra is Agra Cantonment (AGC). You can book your tickets on the Indian Railways website. Try taking the train journey during daylight. Avoid traveling by train in the night to and fro from New Delhi for security reasons, especially if you are a solo female traveler. If you want to hire a car to travel to Agra, then there are many available vendors in New Delhi. The cost of to and fro journey would cost up to of 5000 INR. You can book a cab here on Savaari Car Rentals or take Ola outstation trips or even an Uber. Upon reaching Agra through air, bus or train, use the 24-hour official prepaid auto rickshaw and taxi booths just outside the airport, bus stand, and railway station to reach your hotel. All petrol and diesel vehicles are prohibited near the monument to curb pollution and further damage from the soot from these vehicles to the sparkling white marble of the Taj. There is a designated spot where you will be dropped from where you can walk 600 meters to the entrance or there are frequently plying electric vehicles. You can hitch a ride with them for INR 20 per head. Or you can take a cycle rickshaw for INR 50. 5. Where to stay near the Taj Mahal? 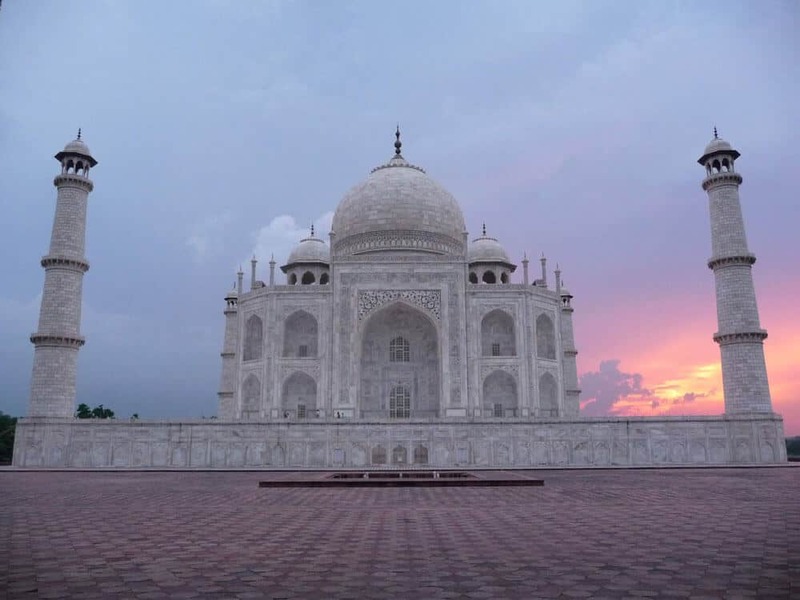 There are multiple hotels in Agra and near the Taj Mahal where you can stay overnight. Here are a few suggestions for accommodations for a range of budgets. For luxury travelers, there is the Oberoi Amarvilas, a 5-star hotel. It is just 600 meters away from the monument of love and every room has fantastic views of the Taj Mahal. You can relax, dine and rejuvenate in the spa with luxury meant for the Royals at prices starting from 32,000 INR (approx. $470) per night. Other semi-luxury hotels are Jaypee Palace Hotel, Courtyard by Marriott Agra, Trident Agra, and ITC Mughal, Radisson, Hotel Ramada to name a few. The price per night ranging from 6,000 – 10,000 INR ($ 90 – $ 150). If you are a backpacker with a minimal budget, you can stay in hostels like Rhine Hostel, Spiritual Yoga and The Coral Court Homestay for as little as 1000 INR ($ 15) or less than that. Like any other monument across the world, eating and smoking are strictly prohibited in the premises of the Taj Mahal. If you are traveling with kids, have them fed well in advance as the trip inside the Taj Mahal will surely take a good 3-4 hours of your time. As suggested above, if you are staying longer, from sunrise to the middle of the day or from mid-day until sunset then eat well in advance. There are free water dispensing units inside the Taj Mahal, but carrying your own bottle is better to avoid the long queue waiting to drink water. Though there are no restrictions on the clothes that you can wear, it is wise to be dressed moderately. If you want to enter the mosque inside the monument, being well dressed helps in entering without any hassle. Read our travel tips for female travelers in India. If you are visiting in summer, do not forget to carry a hat and cover your arms will full sleeves clothing as the sun gets very harsh. Carry a sunscreen at any cost. 7. Is the Taj Mahal disable friendly? Yes, the Taj Mahal is disabled-friendly with wooden ramps provided near the entrance, the security checkpoint and when you pass through the Southern Gate. Since the whole monument is vast, it is better to have an electric wheelchair to steer within the complex. There is an electric vehicle which ferries visitors from the parking lot to the Taj Mahal as all private vehicles are banned near the Taj Mahal. This electric vehicle does not have a built-in ramp for visitors on a wheelchair to board. You might need help in boarding the electric vehicle and carry your wheelchair separately with you. If you are in an electric wheelchair, you can go the entire distance on your own since the Taj Mahal is just 600m away from the parking lot. This 600m distance is flat and paved well, so reaching the monument should not be a problem. The only regrettable side to visiting the Taj Mahal is that there is no ramp built to access the main mausoleum for wheelchair-bound visitors. 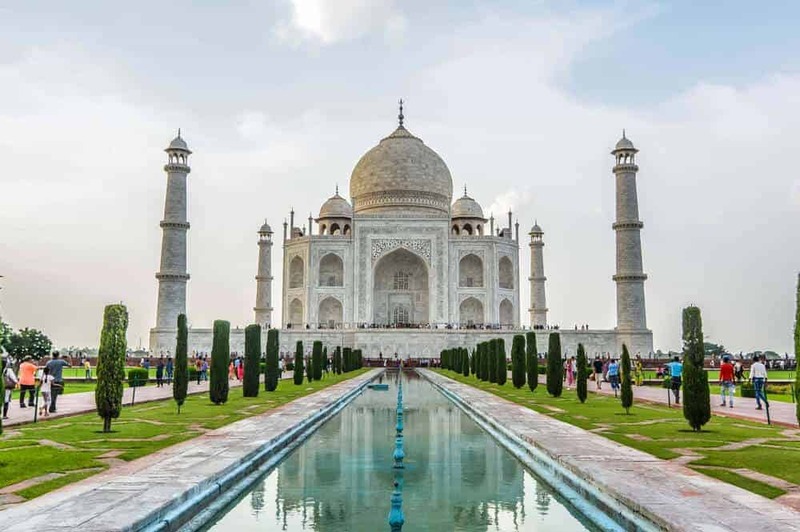 You can read more about a fellow traveler’s experience on the wheelchair when she visited the Taj Mahal here. You can also read reviews and suggestions from locals on TripAdvisor if you need help with the wheelchair when you visit the Taj Mahal. Ignore all beggars and touts at the railway station, airport or at the Taj Mahal. Arrange for a guide beforehand from a registered tour agency or request a guide to be arranged by your hotel. You will find guides waiting to assist you outside the Taj Mahal too but always ensure they are recognized and approved by the Ministry of Tourism, Govt. of India. A half day tour costs around 1000 INR and it is really worth every rupee as the monument is of historical importance. Also, you can book a guide online at Tours by Locals or Get your guide websites in advance so that it’s easy and hassle-free on the day of your travel. The Taj Mahal Museum is known as the Jal Mahal, it is on the west side of the complex. The origin of the Taj Museum dates back to 1906, it was created under the orders of Lord Curzon, the British Viceroy to India. It houses interesting artifacts from the Mughal era like calligraphy specimens, utensils used in everyday life, plans and drawings of the Taj Mahal. The main hall has paintings made by Shah Jahan and his wife, Mumtaz Mahal on ivory framed in ornamental wooden frames. The entry to the museum is free and is open from 9 am to 5 pm on all days except Fridays. There is no queue to enter, you can just walk in. There is no necessity for a ticket as it is inside the monument. Agra Fort is a UNESCO World Heritage Site, also called as the Red Fort of Agra. It is situated around 3 km away from the Taj Mahal. After Shah Jahan’s son Aurangzeb deposed his father and restrained him in the Agra Fort. It is believed that Shah Jahan died in Muasamman Burj, which had a view of the Taj Mahal. The Agra Fort is a palatial red-sandstone and marble fortress, which was built between 1565 and 1573 on the banks of the river Yamuna by Akbar, the Mughal emperor, and grandfather of Shah Jahan. Do not miss visiting the Shish Mahal which was a Summer Palace built by Shah Jahan. The roof in the interiors of the Shish Mahal is embedded with thousands of well-cut mirror pieces sourced from Haleb, which is present-day Aleppo in Syria. Check out this video to see how the glass pieces shimmer in candlelight like a star-studded night sky. Akbar’s tomb is around 16 km away from the Taj Mahal and has a Mughal style of architecture with red sandstone as its theme. Akbar’s tomb is not as glorious in its grandeur compared to the tombs of Shah Jahan and Mumtaz Mahal. This tomb for Akbar was built by his son Jehangir between 1605–1613. When you are at the most beautiful monument ever on this planet, there is obviously an urge to take a sweet souvenir home. Especially a piece of marble with motifs on it, why not? To buy quality products and value for your money, shop at The Warehouse of Gifts & Souvenirs. Though not really anywhere close to the Taj Mahal, it is around one kilometer from the Southern Gate. Hire a rickshaw or take the help of your guide to reach this shop. It is on the Agra – Bah road. The exact location is – 18/151 Purani Mandi Crossing, Opp. Shah Jahan Garden, Near Agra Golf Course, Bansal Nagar, Tajganj, Agra, Uttar Pradesh 282001. You can find great reviews about them on their Facebook page. Talk Travel suggests the best places for the benefit of travelers and we do not promote any brand or souvenir shops for business gains. As suggested, book your entry tickets online, book the hotel and the tour guide all in advance to enjoy a hassle-free experience. 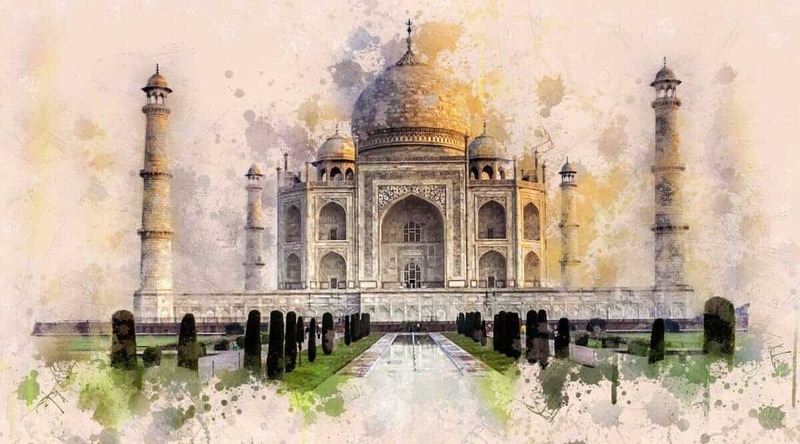 A visit to the Taj Mahal is worth the miles traveled as its unique history, unmatched beauty and the theme of eternal love will leave long-lasting memories in your heart. Are you traveling around India? You might want to look at the other guides and posts we have written for India, to make your travel more easy and enjoyable.